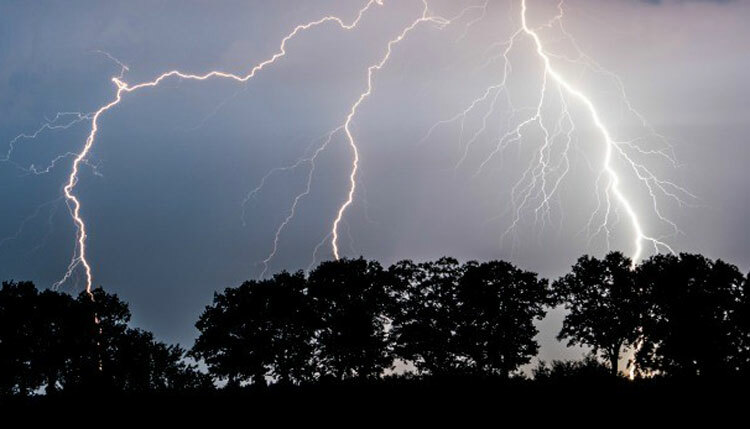 Fourteen people were killed in lightning strikes in Naogaon, Sirajganj, Gazipur, Sunamganj, Magura, Brahmanbaria, Noakhali and Rangamati districts on Sunday. According to reports, Shamsul Mondol, 57, and his son Arman Ali, 17, of Kazipur upazila in Sirajganj were killed when a streak of thunderbolt struck them while working on their peanut field at a char along the Jamuna River. In another incident, Abdul Quader, 37, son of Aher Monadol of Pestak Kura village, was killed in a lightning strike while cutting paddy on his field amid rain, said Abu Oabida, officer-in-charge of Kamarkhand Police Station. Besides, two college students--Nabil and Poling, 1st year students of Shahzadpur Degree College and residents of Soyanipara in Shahzadpur upazila, were killed when thunderbolts hit them in front of Upazila Land office at noon. In Noakhali, Iqbal Hasnat, 15, a class VII student of a local high school and son of Sohel Rana Jaglu of East Laxminarayanpur village in Noakhali municipality area, was killed when a thunderbolt struck him while playing around 11 am. In Magura, three people were killed by lightning strikes in separate places of the district. The deceased were identified as Alam, 35, of Bulugram, Shibananda, 40, of Araisat village and Mehedi, 18, of Sadar upazila. Alam and Shibananda were killed when a thunderbolt hit them during rains while Mehedi died as he fell from an electric pole after being hit by a thunderbolt while working. In Rangamati, Mansura Begum, 32, of Baghaichhari upazila, was killed in a lightning strike while bringing back home her cattle from field around 10 am, said Amir Hossain, officer-in-charge of Baghaichhari Police Station. In Sunamganj, Liton Mia, 30, a farmer of Syedpur village in Sadar upazila, was killed when a thunderbolt struck him while working on his cropland around 8:30 am.